This IBM® Redbooks® publication covers the planning, implementation, and management of IBM System z® FICON® environments. It discusses the FICON and Fibre Channel architectures, terminology, and supported topologies. 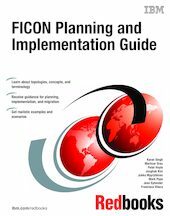 The book focuses on the hardware installation and the software definitions that are needed to provide connectivity to FICON environments.You will find configuration examples required to support FICON control units, FICON Channel-to-Channel (FCTC), and FICON Directors. It also discusses utilities and commands that are useful for monitoring and managing the FICON environment. The target audience for this document includes IT Architects, data center planners, SAN administrators, and system programmers who plan for and configure FICON environments. You are expected to have a basic understanding of IBM zEnterprise™ and System z10® hardware, HCD, HCM or IOCP, and a broad understanding of the Fibre Channel and FICON architectures.